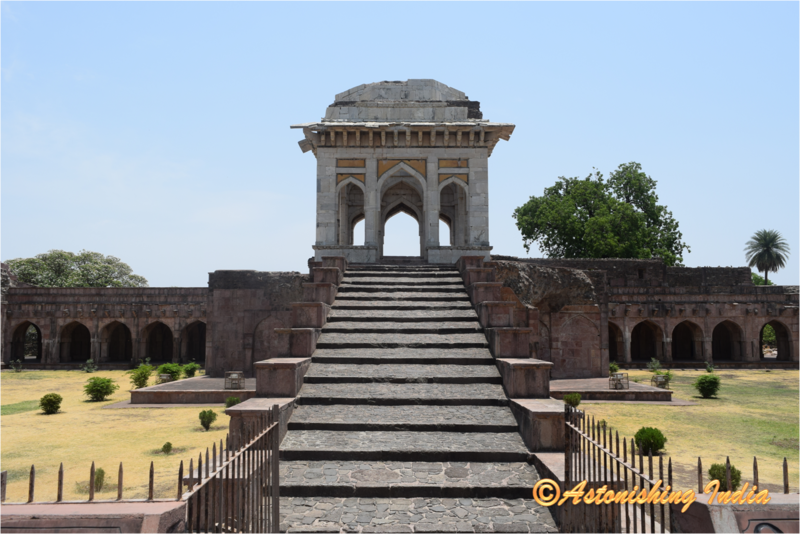 Hidden from view at a distant hill towards the western end of Mandu plateau, are an old fort’s ruins “Budhi Mandu“(translated literally it means ancient Mandu) dating back to tenth century with a large lake and group of temples. But this is not where you tread because a dense forest makes it almost impossible to reach there. The area remains largely unexplored. It is on the other irregular hill that has a deep chasm from the east running to almost center of the hill and Nimar plains 300 meter below in south. The main emphasis of fortification thus was on northern side and south-west. 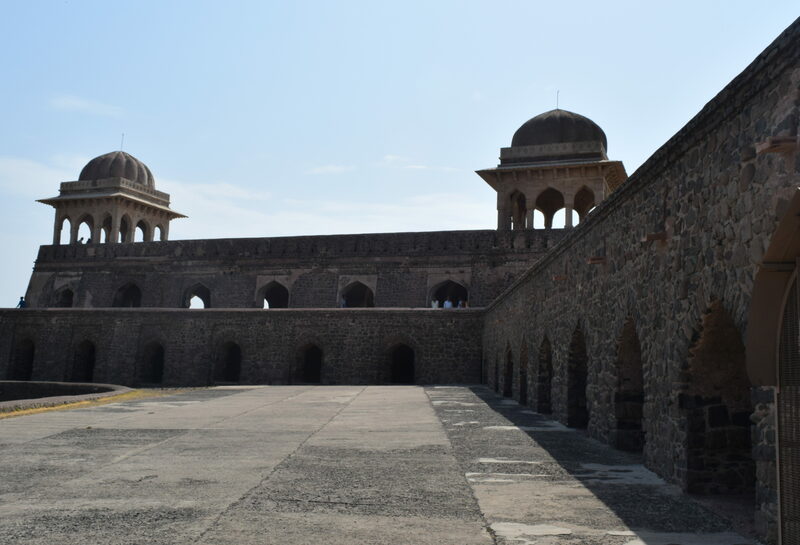 Various rulers left their architectural mark in the fort either by enhancing their predecessor’s contributions or by adding more buildings to the city. The ruins thus now have been classified in distinct groups. Some of the buildings much more in ruins than others are rendered unapproachable due to the overgrown shrubs and thorny plants. The Royal Enclave has some of the important buildings. 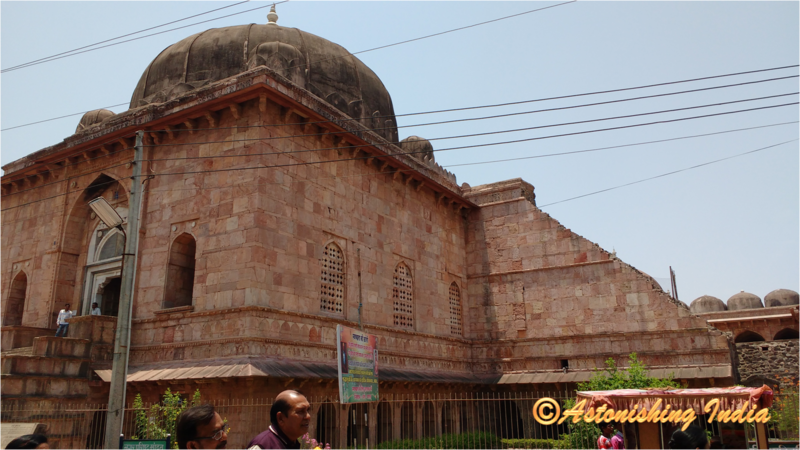 Hindola Mahal, which has been made in a trapezoidal shape seems to grow directly from the ground surface. The bold lines of the structure with minimal beautification is a design feature in itself. The sunlight seeps in the now absent roof to create eye catching patterns of light and shadow enhancing the structure’s symmetry and wide huge arches. 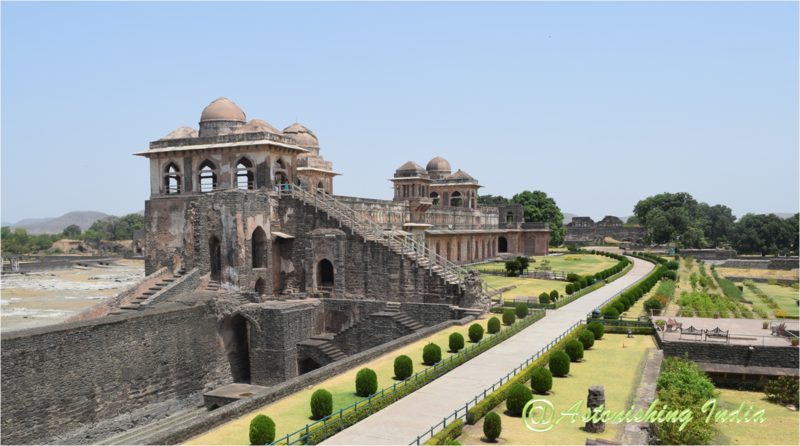 Jahaz Mahal, another most popular structure, that finds itself representing Mandu on almost all travel and tourism guides is an impressive structure in sheer size and its conception. With rains filling up the huge water tanks Munj talao and Kapur talao on both sides, the palace looks like a ship anchored in water and hence the name. If stories are to be believed, Mughal Emperor Jahangir and his beauteous wife Noor Jahan would reside here in monsoons when in the light of full moon the palace acquired an ethereal feel. 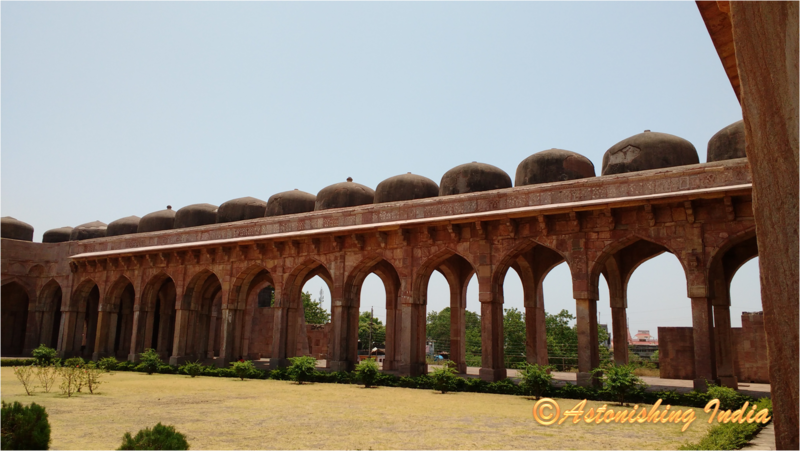 Close to Jahaz Mahal are ruins of another palace that had a sweet water well. It is said that the flavour of water was akin to ‘champak’ flower and hence the name Champa Baodi. Closer to this well is Hammam, the sauna bath of olden times. The ingenious system of construction allowed water heated by coal to run in water channels before draining away. 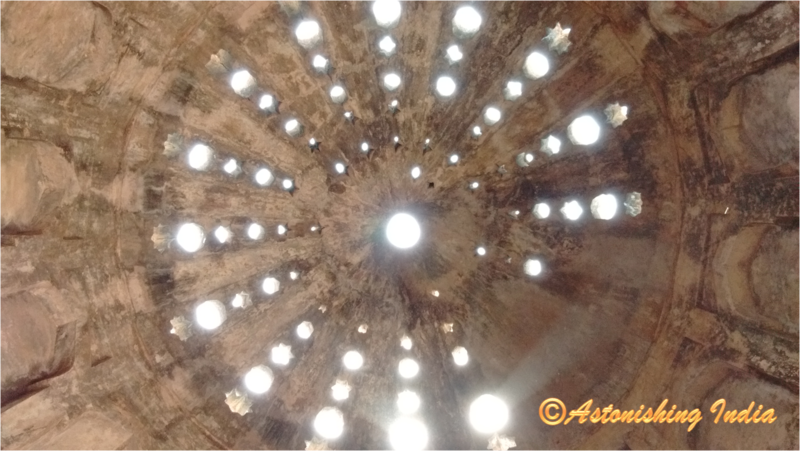 A dome roof punctured with star shapes for ventilation creates beautiful pattern on the floor. Once upon a time marble panels and medallions of blue and yellow stone adorned this steam room. 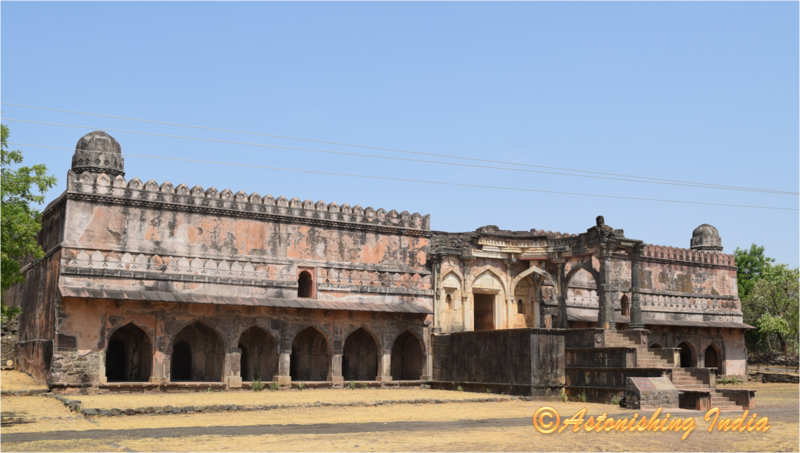 A stable block was but a mandatory requirement near the palaces and Taveli Mahal had once fulfilled that need. 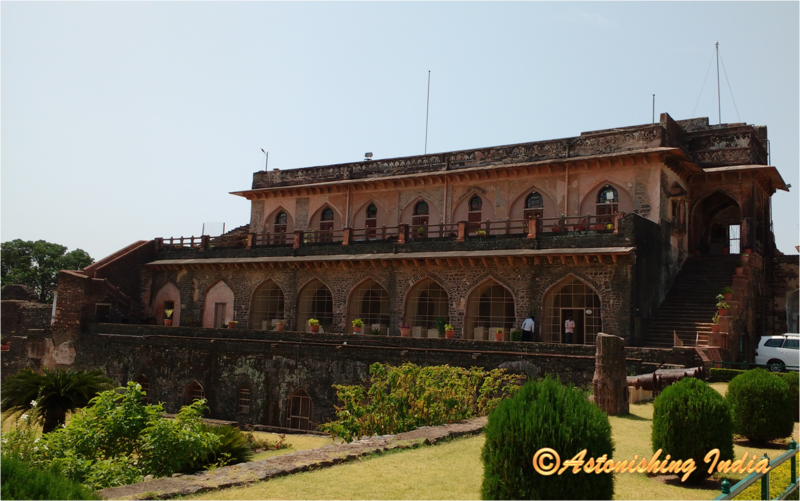 It however now houses the tourism department offices at Mandu. The Mandu Village group of structures was where we had disembarked from our vehicle but the guide insisted we visit those structures while returning. 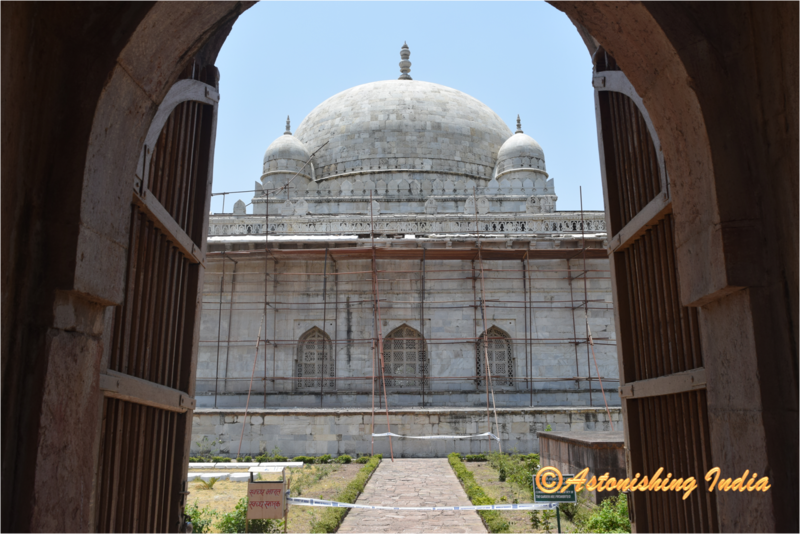 There are impressive buildings in this group as well in Hoshang Shah’s tomb, Jami Masjid and Asharfi Mahal. Hoshang Shah is credited with establishment of town Hoshangabad. He was not confident that his descendants would honor his death with a grand mausoleum and hence started construction of his tomb much earlier. the marble clad tomb has plain exteriors and interiors with little embellishment. However perforated screens that let in light have beautiful geometric patterns. The structure was undergoing renovation at the time of my visit. Jami Masjid based on great mosque of Damascus, the construction was started by Hoshang Shah. Conceived on a grand scale, the mosque stands on a huge plinth rising about 4.6 meter above ground level. The account narrated by the guide relating to Ashrafi Mahal was by far more interesting than the actual historical one. 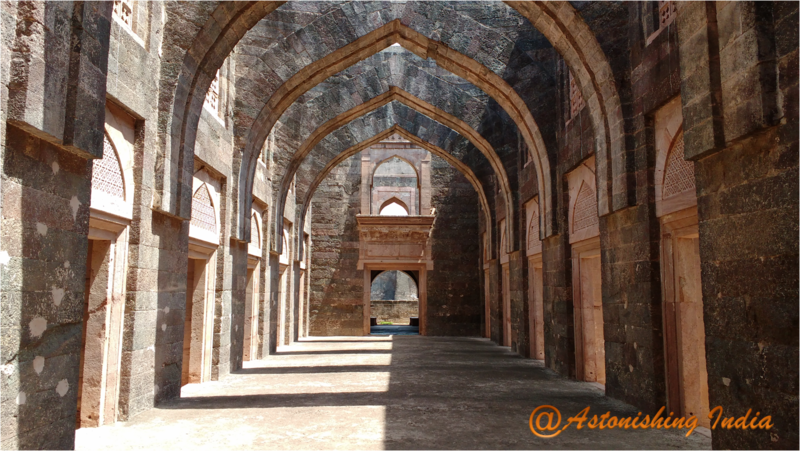 Ashrafi Mahal was a Madrasa or study center for scholars, attached and designed in conjunction with the Jami Masjid in front of it. Later Mahmud Khalji raised a seven story victory tower to commemorate his win over Rana of Mewar. The tower however collapsed. Now that is some punishment…I guess having a private gym in confines of palace was too much to ask for! The other structures spread beyond are grouped under Sagar Talao of which the Caravan Sarai seemed impressive in its size. Malik Mughith’s mosque has been built after destroying an old Hindu temple as is evident from the finely carved pillars inside. 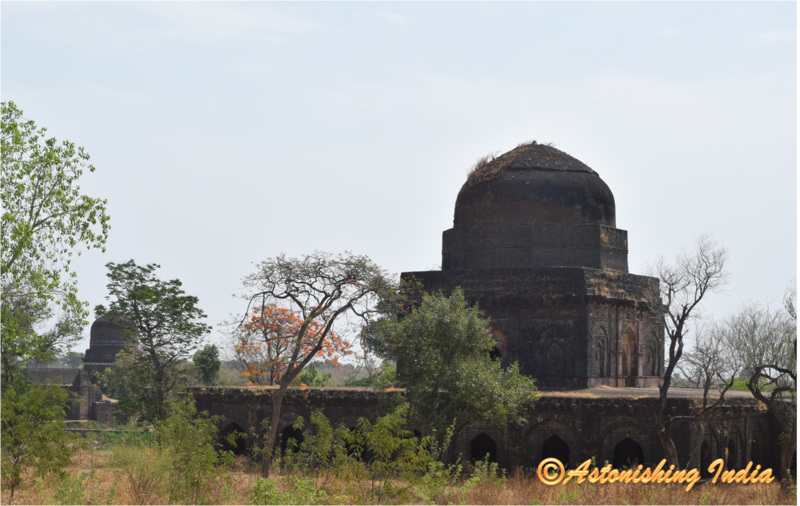 There also are two large tombs for the ‘wet nurses’ named Dai ka Mahal and Dai ki Behen ka Mahal. It is while returning from visiting these structures that the guide stopped at one echo point. The way the structures are placed in proximity to each other and the forest in the valley, it makes the sound echo and reverberate. the guide promptly showed us different angles where the sound echoed once and then re-echoed seconds later. 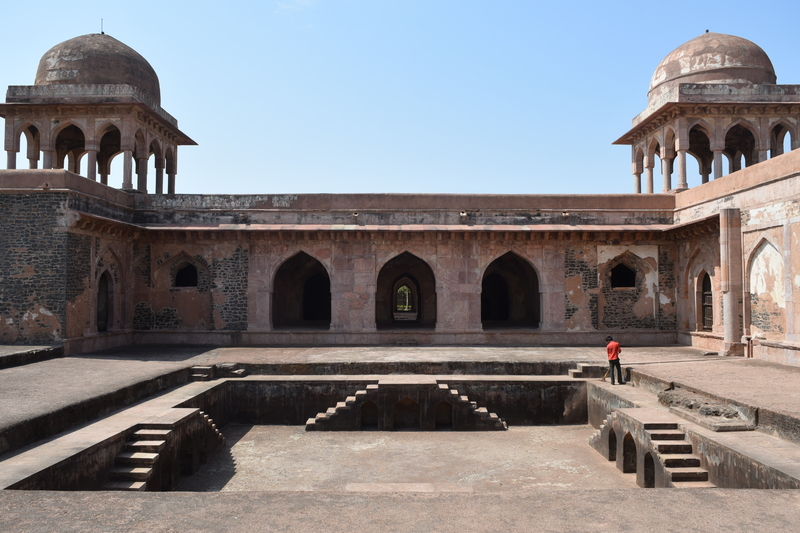 The Rewa Kund structures are what make Mandu popular among masses with its Baz Bahadur’s Palace , Rani Rupmati’s pavilions and the associated tragic love story of the two. Mandu spread on the hill has many more structures scattered all over telling the tale of yesteryear but the ruinous state and thick shrub growth renders them inaccessible or so I was made to believe by the guide who seemed tired of interruptions and photography. It is monsoon season that Mandu turns into a green haven and it is when one should explore these ruins. My visit was ill timed as the ruins lay merged with dry bleak brown landscape. Though many stories trapped in scattered ruins are lost to us but nevertheless a slice of history did unfold when I visited the historic ruins. A visit to this town is hardly a disappointment.